Before I start building my experimental bamboo guitar, I want to know a bit more about the properties of the bamboo sheets I’ll be using. In particular, I need to know how it compares with the Tasmanian Blackwood I normally use. I want to build a guitar that’s as similar as possible to my successful blackwood-bodied Parlour 6 model, so the first thing I need to know is how thick to make the two panels I’ll be joining to make the back of the soundbox. Even within one species of timber, each piece is different from every other piece, so I’m expecting huge differences between bamboo and blackwood. Gore and Gilet (Contemporary Acoustic Guitar Design and Build, Trevor Gore, Australia 2011) offer a very useful way of predicting the thicknesses of panels of different density and stiffness so they will all perform in a similar way when built into a guitar (page 4-60). I can’t recommend this book too highly if you have an interest in how guitars work. Because I aim for a “live back” instrument (one in which the back vibrates and contributes extra complexity to the tone of the guitar), I need to create a bamboo back as close as I can the the blackwood ones I know give me the effect I want. What I want to measure is the stiffness of the bamboo so I can compare it with blackwood. The way to do this is the tap the panels before they’re joined, and measure the frequencies at which they ring when tapped in three different modes – one indicates the stiffness along the grain, the second across the grain, and the third in its twist or torsional mode. Gore and Gilet give an equation that combines these three factors with the material’s density and panel size to give an estimate of how thick to machine a panel (Equation 4.5-7, page 4-61), but more of that later. where you hold (that is, damp) the panel. You can see that if you support the bar at the nodes, you won’t damp this vibration as long as the rest of it is free – in a marimba, each bar is supported at 22% of the length from either end, and struck at the antinode in the middle. It rings at quite a low frequency, and has good sustain because there’s lots of mass in motion. If I strike the panel at 22% of its length from the end, and in the middle, I won’t be exciting the first marimba mode too much because I’ll hit it on a node. So, I pinch the panel at 22% of its width from the edge and about halfway down the length of the panel. This tap won’t produce much of a ring, and it will have a higher frequency than the first mode it’s effectively a short bar and the amplitude of the vibration isn’t great. This one is the hardest to get a clear result for. 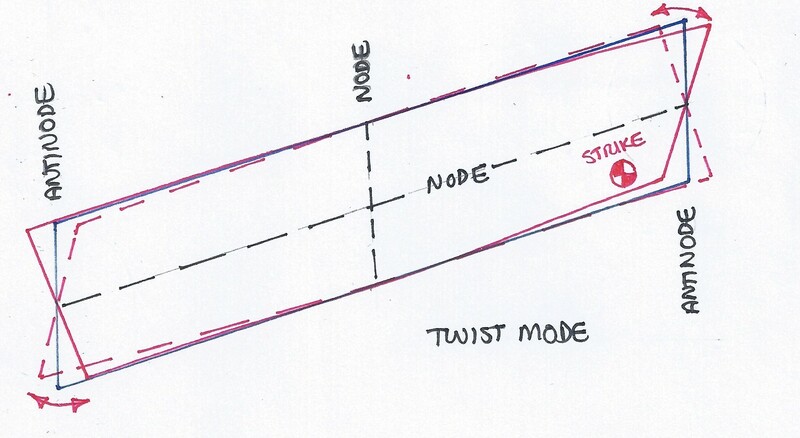 This one has two nodal lines, so I support it halfway along the length and strike one corner. This one gives me a lower tone with good sustain. This plot shows the average of my twelve taps – each one is slightly different, so it’s better to amalgamate them all rather than trust to one on its own. I then use the Export button in this Frequency Analysis window to create a .txt file, which I can then import into Excel. Why bother? 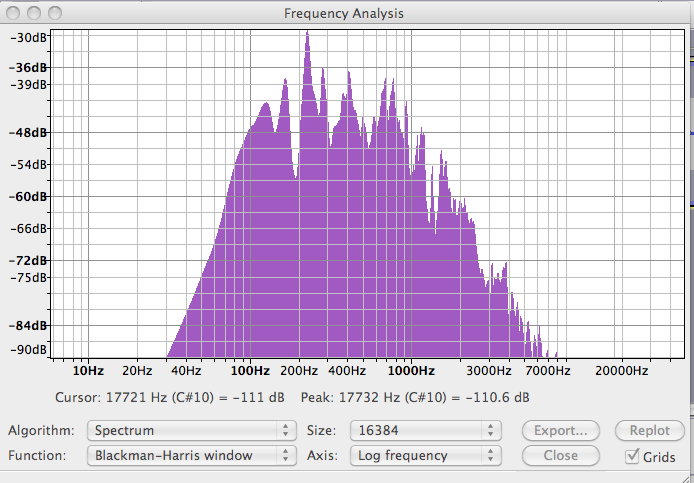 I can plot my own graph in Excel which lets me zero in on the frequency bands I want – in this case from 0 to 300Hz. This all sounds complicated, but it’s become quite a quick process now I’ve practised a bit. This shows all three modes plotted against each other (another reason for using Excel). You can see the main resonances as peaks on the line as usual. Looking at the blue line (showing the vibration along the grain of the panel), you can clearly see the fundamental frequency is at a little over 100 Hz (109.0 Hz to be precise). The lowest frequency peaks for the red (across-grain) and green (twist mode) aren’t as easy to sort out. Because it’s very hard when you’re testing one mode to damp out the other two completely, there is usually some doubling up that I need to sort out. The strongest response for the across-grain mode is at 226.1Hz, but you can also see I haven’t successfully damped out the along-grain or the twist modes. However 226.1 Hz is clearly the strongest response for the across-grain mode. The green (twist mode) has its lowest peak at 80.1 Hz, but I failed to completely damp the across-grain response. The along-grain response was completely damped out because I was holding the panel right where the antinode falls – no vibration possible. This entry was posted in Bamboo guitar, Tap testing and tagged antinode, node on August 26, 2013 by Michael Williams.